Project Dare got off to an excellent start in 2019. The first ‘LGBTQIA+ Dare Sessions’ * are well under way with 16 students taking part in the 12 week course, which is being run in conjunction with the Recovery College (SLaM). The course, which was designed by LGBT service users with Project Dare founder Ursula Joy, aims to nurture confidence and a positive body image. Project Dare has gone from strength to strength – nominated for an Innovation in Lambeth award in the NHS Lambeth Clinical Commissioning Group 2018 Lammy Awards last September. The awards recognise those that go the extra mile to provide exceptional health and care services in the borough. Project Dare also collected a healthcare innovation award from the Health Innovation Network. To focus on the young people theme of World Mental Health Day last October the project ran a body confidence and female empowerment session for 75 students at North London’s Latymer Grammar school. « The school contacted us as they wanted to have some outside facilitators come in and inspire the girls to enjoy confidence and being their authentic selves,” says Ursula. The teachers said “the students were engaged and enjoyed themselves, it was great for them to work with different people and they saw some lovely interactions from the girls, which they would love to see more of – but because of exam stress and other worries, they don’t often get the time to enjoy just looking after each other. It was great to have a workshop where the ladies just talked about being confident. They often forget this and just need to be told it’s important. The atmosphere was nurturing and supportive and we need more of it”. “All of our participants have moved from ‘below average’ wellbeing and body image psychological scales to ‘average’ levels,” says Ursula, speaking proudly of those taking part in the Body image and confidence (Body Adoration) workshops she has been running since 2013. While the figures and outcomes (see below) pack a powerful punch, it is the shapeshifting and creative qualities of its inventor (acting, peer support, comedy, cabaret and science, to name but a few) that make this project so Daringly different. At ‘home’ in Lambeth, South London, Ursula outlines the visionary Project Dare, a not-for-profit social enterprise she has built on her lived experience of mental health and vast archeology of her life. Her mission… “to help people feel better in their own skin so they can move forwards with their lives”. The project has reached hundreds of young people and adults, including those with mental health issues and unemployed. Its first impact assessment/report in 2016 whet the appetite of those working in mental and public health and education. “I am more confident to try new things. My body is beautiful, I can reclaim my sexuality after years of abuse, ” says one Darer, in a moving testimonial. Says Ursula: “What surprised us most is that our groups report feeling more sociable and have more ability to do daily tasks and work, moving from ‘severely impaired’ to significant/moderate categories on Project Dare measures. At a time when statistically obesity, self-harm in young women and suicide in men is on the rise in the UK, Project Dare nurtures positive relationships with body, food and mind. “Each of us have a special body and you realise you don’t have to do a lot…” says Nina, in a moving testimonial about the workshop, see Social Impact report below. Ursula calls on commissioners to seize the opportunity and recognise the community value and social impact of the project and invest in it further to make it more sustainable and able to be scaled up. Project Dare inspires by setting participants ‘dares’ to do each day, which help build resilience. When individuals are inspired they can live full lives, both mentally and physically. For the most marginalised, being able to nurture a positive body image and positive mind gives people confidence to access health services, education, to become more sociable and reconnect to their community and job opportunities. As well as the recent award from the Health Innovation Network, Ursula received a small Lambeth Clinical Commisioning Group Innovation grant and support to incubate and grow the project, and has also been funded by the London Community Foundation (Building Communities in Coldharbour initiative). The Foundation’s Victoria Warne said Project Dare has an extremely positive effect on the mental and physical health of Darers (participants) and their families at a time when “people’s relationships with food and their bodies are often at the forefront of everyone’s mind”. It’s about people living their lives to the full,while working creatively to prevent people reaching crisis point when they may need the support of secondary care. A mental health bed costs approximately £450 a day, while Project Dare workshops cost from £425 per person for six weeks. “It’s cost effective and has a proven track record of restoring people’s self esteem,” says Ursula. Laura Williams, Assistant psychologist and counsellor (South London & Maudsley NHS Foundation Trust) was impressed by a safe and creative space where everyone was valued in the workshops; ‘the emphasis was on personal freedom and expression’ and as sessions progressed ‘individual personalities, opinions and experiences shone through’. 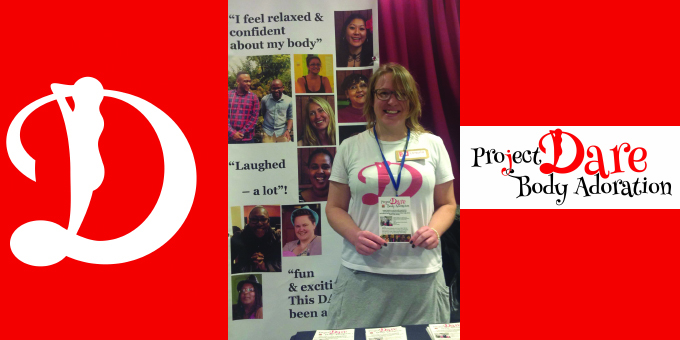 Project Dare offers a myriad of routes to clients, the community and professionals. Clients can use their personal budgets or other types of funding to pay for their place on a course. Refer individual clients onto courses that run throughout the year. Click here for Ursula’s website for more information. *The letters LGBTQIA refer to lesbian, gay, bisexual, transgender, queer or questioning, intersex, and asexual or allied.